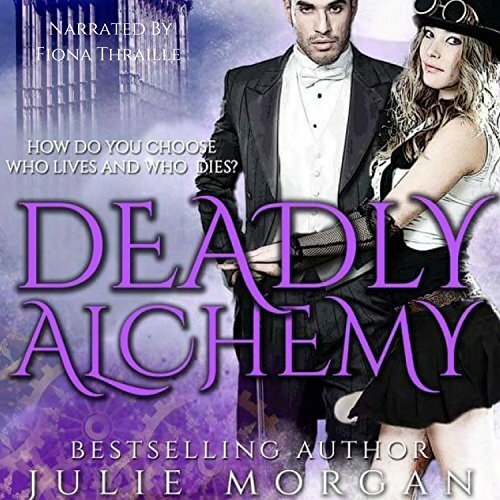 If you could sum up Deadly Alchemy in three words, what would they be? Fiona Thraille's voice kept me in the period. Reading the book myself, I might have had a more difficult time staying in that Victorian era. The actions of the characters sometimes appeared more modern, but when read by this narrator I was able to stay submerged in the setting. Several moments in different ways. I loved the "dream" moments but wanted to scream when the dreams ended and the realization sank in that it didn't really happen (breathing heavily). But I loved it! Then there was the blood and gore and bathtub... Ugh! I won't say more on that. You need to read it to get the full impact. Not being a big fan of steampunk, vampires or werewolves, I wasn't sure how I would feel about this book. But I have read other books by this author and thought I would give it a try. I am so glad I did! Started listening late afternoon and at 1:30 in the morning I couldn't stop! Listened straight thru to the end and loved it! Edge of seat performance and storyline. WOW. The narrator was perfect for the story line. The story drew me in and kept my attention. Filled with suspense and romance this is a must have for one's audible library. Worth listening to while sleeping and working. Fiona ThralLee is an Awesome narrator and makes you feel like you are in the story. Fantastic story! Love the Narrator. This book had me from the beginning. There was no messing around, the character development was fast paced and exciting. Easy to visualize the scenes. The narrator is fantastic!! I could listen to this story all day! Can't wait for the next one! I bought this for Fiona's narration, since I loved her voice in &quot;The Giddy Death of the Gays and the Strange Demise of the Straights&quot;.